In fact, Kiwi homeowners could be in for a slap in the face this year! All the details in a moment, but first — a quick story about a man who, instead of putting his eggs in one basket, decided to tape them to his belly. Jeffrey Lendrum was caught on May 3, 2010 in the Birmingham Airport with 14 peregrine falcon eggs strapped to his abdomen by surgical tape. The small eggs were destined for wealthy Middle Eastern falconers with the expensive desire for these rare raptors. These eggs are worth $50,000 to upwards of a quarter million per bird. So Lendrum’s unhatched prizes attached to his midriff represented over $700,000 in smuggling revenue. Allegedly, he ‘helicoptered up and rappelled down to aeries on cliff faces from Patagonia to Quebec’ to harvest the eggs. After being caught, Lendrum was handed a massive fine, along with two and half years in prison. I suppose that’s his yolk to bear. Could we see this NZ investment splatter? I mean, imagine if airport security had patted him down…and smashed the eggs under his shirt. He wouldn’t just have egg on his belly. He’d have egg on his face too. All of that hard work, just to lose it all in a fleeting moment. But it’s not too different from a Kiwi property owner today, is it? Too many people have loaded up on debt to buy overpriced properties…properties that could easily see a 10%, 20%, even 48% haircut in value in the coming months. It’s a fragile and risky venture. But few would call it as such. In fact, most Kiwis I talk to consider property as one of the safest, most reliable investments they can make. They’d look at the meteoric rise in property values over the past several decades and call it ‘normal’. 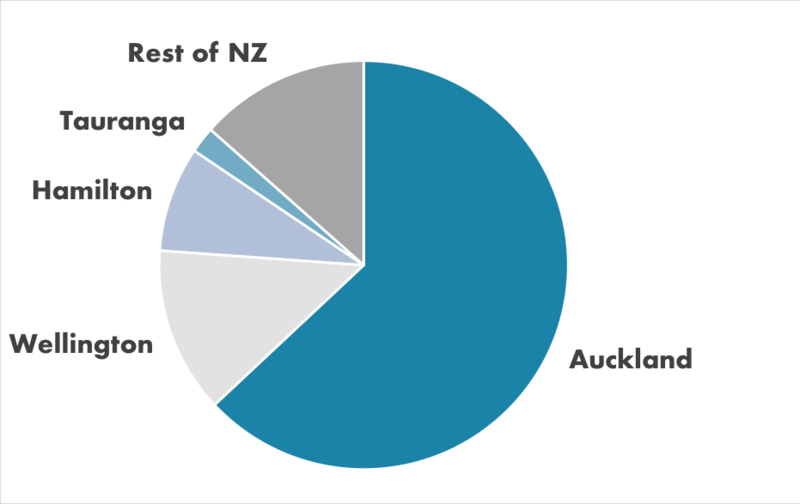 In truth, New Zealand’s property market is far from ‘normal’ in the global context. It’s a freak. It’s an abnormality…and one that’s overdue for a correction. Listings are down 17.7% year-over-year. Auckland listings alone are down 23.6%. Between November 2017 and 2018, Auckland asking prices fell 2.9%. And residential building consents fell 4.4%. At the same time, NZ lenders are now taking a closer look as to how well applicants can service their loans. Thanks to the Aussie scandal last year, banks are squirming under the spotlight. This is all happening at the same time as the foreign buyer ban stifles demand, as capital gains taxes are being discussed, and as ring-fencing regulation pushes out investors. How far do New Zealand property markets have to fall? We’ve read a lot of differing views on what the correction could look like…from negative 48% to single digits. Frankly, there doesn’t seem to be much science behind it. And there’s a reason for that. Based on the science, New Zealand’s property market has been overdue for a correction for a long time now. The crazy part? Colombo wrote that article nearly five years ago…and basically all 12 of those threats are still relevant. So if Colombo was so certain back in 2014…and had reasonable points to back up his argument…why hasn’t the bubble popped? Economic theory suggests that it should have popped years ago…and yet, here we are. All I can do is add up the factors pointing to a crash…and compare them to the factors pointing to a boom. On one hand, you’ve got everything from regulation, to global market tensions, to economic indicators, to expert evaluations, to currency concerns, to diminishing demand, to interest rate hikes, to new taxes. On the other hand, you’ve got a couple decades of skyrocketing prices that hardly seem like slowing. To me, the scales are heavily-tipped towards correction…and even if things go well, the risks greatly outweigh the potential rewards. An ‘asymmetrical’ investment, as it’s called.